I saw this picture elsewhere and lost it, its cool and a bit worrying, thought of course the scale is so out of kilter it’s almost sublime, but if you figure this only the big stuff and that it’s all in motion all the time and new stuff is going up there, then the worry is not so out-of-place. All sorts of solutions for removing this stuff has been proposed, from robo tugs to catchers mitts, and evaporating them with lasers. That last has been under study since the 1990’s and you don’t have to blow them to ‘microns’ you just have to slow them down enough so they did into the outer atmosphere and come crashing to the ground. 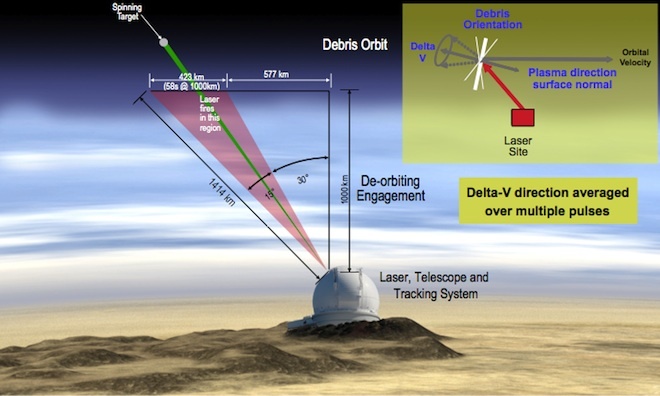 And in the end I think the laser broom will be used, to deorbit bolts, dropped tools, smashed up debris etc, not worth recovering. But a lot, even most of the material up there probably can be reused. If we could cheaply catch the small stuff, maybe my using the Laser Broom to guide it into a catch basket, there is plenty of solar power and vacuüm to smelt the metals and create new things. Using spare material, sunlight, natural vacuüm and microgravity environment it seems reasonable that we could design and build a large-scale Additive Fabrication Machine in orbit that could build space craft parts from scrap. In the long run we then start getting the materials from asteroids or the moon and off we go into the solar system. This entry was posted in eSpace, Future, Space, Tech and tagged commercial space by Sci Fi Engineer. Bookmark the permalink.